Desiree from So Sew Mama is getting Married this August! What better way to celebrate than to have an awesome giveaway!! So Sew Mama has gathered a group of amazing bloggers to bring you all this great giveaway. 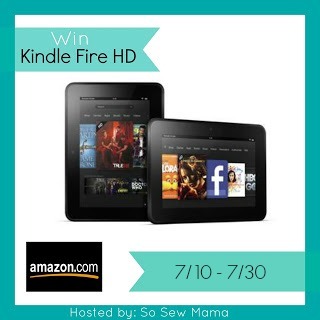 One lucky reader will have the great opportunity to win a Kindle Fire HD! Use the Giveaway form below to enter. Entries that are not mandatory, will increase your odds of winning. Good Luck! Everything For Ana was not compensated for this post, and is not responsible for prize fulfillment. This giveaway is not affiliated with Facebook, Pinterest, Twitter, or any other social media website. Please contact Desiree at So Sew Mama with questions, or to have your company/product featured in our next big giveaway! Read my Full PR disclosure here. It would be for me everyone else has one. My favorite holiday is Halloween love the junk food and goodies. This would be for me if I won. If I won, this would be for my mother who has always loved to read. This would be for me and hubby! We would all share it. Thank you! It would be for me.My BD is july 28th so this would count as my present! I would give this to my grandson.... he has been asking for it since it has hit the market. this would be for me only because I already bought one for my grandaughter. I would probably give it to a relative. It would be for hubby. It would be for our family. I believe I would keep. I have never had a tablet or a smart phone for that matter. I would love it I'm sure. It would be for the family but i would probably use it more. It would be for my sister! This would be for me. I have wanted one for a long time and I LOVE to read. It would be so great to have my books on here! Me! Hope I;m not being selfish. So much you can do with the Kindle. This would be for me andI would give my granddaughter the other one I have. This would be for my wife. Thanks for the giveaway…for my daughter ! My whole family would enjoy this! We've wanted a Kindle for a long time now!